LUHANSK, Ukraine -- Exchange of captured fighters offers some hope that the Minsk peace deal will be implemented despite continued fighting around Mariupol. Ukrainian prisoners of war prepare to be exchanged for members of pro-Russian forces near Luhansk on Saturday. Ukrainian government forces and pro-Russian separatists have exchanged dozens of prisoners, a Kiev security official confirmed on Sunday in a step towards implementing an internationally brokered peace deal. 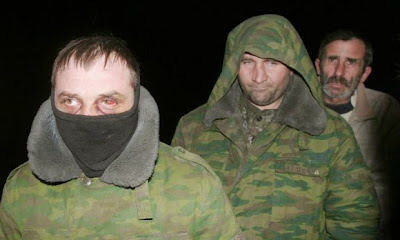 Reuters reporters in the village of Zholobok, 20 km (12 miles) west of the rebel stronghold of Luhansk in eastern Ukraine, saw more than 130 Ukrainian servicemen being released late on Saturday evening in exchange for 52 rebel fighters. The exchange is one of the first moves to implement the peace deal reached on 12 February in the Belarussian capital Minsk after the French, German, Russian and Ukrainian leaders met. Ukrainian security council’s Markian Lubkivskyi, in a post on his Facebook page early on Sunday, published a list of the 139 released Ukrainian servicemen and said the government would do its utmost to free those remaining in rebel captivity. Fighting has eased in many areas since a ceasefire came into effect a week ago, but the truce was badly shaken by the rebel capture on Wednesday of the strategic town of Debaltseve, forcing a retreat by thousands of Ukrainian troops. The Ukrainian military said rebels had launched 12 separate attacks on government troop positions overnight, using artillery and mortar fire. The town of Pesky near Donetsk had seen the most intense fighting, while separatist groups had attempted to “storm” Ukrainian positions in Shyrokyne, east of the strategic port city of Mariupol on the Sea of Azov, it said on Facebook. Kiev accuses separatists of building up forces and weapons in Ukraine’s southeast and has said it is braced for the possibility of a rebel attack on Mariupol. Nevertheless, rebel leaders said on Saturday they had signed a document detailing a plan for the withdrawal of heavy weapons, as required by the Minsk agreement, a sign they may be prepared to halt their advance, having achieved their main military objective by seizing Debaltseve. The rebel press service DAN said Ukrainian troops had been shelling parts of Donetsk, reporting that artillery fire could be heard in the city at around 0730 GMT.